The Retail Prices of Fuel have been revised with effect from midnight today based on the Fuel pricing formula, the Finance Ministry said. Petrol (Octane 92) per litre will be increased by Rs.4 and the revised price is Rs.149, Petrol (Octane 95) will be sold at Rs.161 an increase of Rs.4 per litre. 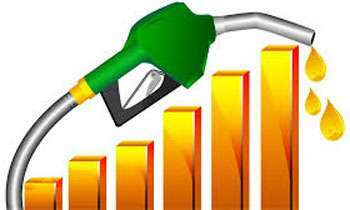 One litre of Auto Diesel was increased by Rs.5 and the revised price is Rs.123 and One litre of Super Diesel will be increased by Rs.3 and the revised price is Rs.133, however, the price of Lanka Kerosene will remain as Rs. 70 per litre. A special committee headed by the Deputy Secretary to the Treasury and representatives of the President, Prime Minister, Ministry of Petroleum Resources, Ministry of Public Enterprises and Fiscal Policy Department has been entrusted with this task. Fuel pricing formula is simple: New Price = Old Price 5 and New Price < Rajapaksha Regime Price. No Spike in World oil prices!!! However, Can't understand how SL fuel price formula works!!???? Our thiefs in parliament do this not depending on hte world fuel prices, but based on our exchange rate, our dollar is depreciation, and to keep up with that they increase petrol prices, but i wonder the impact of importing chairs at 640,000 rs per chair for parliament, and also about their new luxury vehicles imports on tax free,These people are shameless bastards, they live luxurious life by stealing from poor and they dont have a shame on that. We as citizens has to pay more and more but the tourists getting their money back. Wow Lanka what a policy and strategy in order to live In this country. As of now our leaders has no vision. Wow Lanka what a policy n strategy in order to live a Common man living condition in our country. Our leaders have no vision to control the inflation. Please release the pricing formula! hope we don't have to walk the RTI route! Interesting cos the West Taxes Internstioanl (WTI) crude prices, benchmark prices for SL orders are trading at USD 65 or less a Barrell compared to USD 75 a Barrell few months ago, though prices have risen slightly over last few weeks due to temporary US inventory and strong USD. However, overall the crude oil prices are relatively low on MoM basis. This country is not rich as who see it here as USA. And we don't need to implement same system here. Soon people will answer to this coming year. SO FAR WE HAVE BEEN SEEING ONLY THE DEVELOPMENT OF PRIZE INCREASES AND FOREIGN TOURS OF COUNTRY LEADERS. ........ AND MOST IMPORTANTLY DEVELOPMENT OF NARCOTICS. and appoint a new crook. Our thiefs in parliament do this not depending on hte world fuel prices, but based on our exchange rate, our dollar is depreciation, and to keep up with that they increase petrol prices, but i wonder the impact of importing chairs at 640,000 rs per chair for parliament, and also about their new luxury vehicles imports on tax free,These people are shameless thieves, they live luxurious life by stealing from poor and they dont have a shame on that. The new price is nothing to do with world oil price but Rupee depreciation, every moth our rupee is depreciating to Dollars so always Oil price will increase every month, no need of a committee or anyone to calculate the new price. Just add the rupee deprecation to the old price! ie is the new price. This is the formula: old price Rupee depreciation to Dollar = New price oil price!